the pattern has not been tested, but I think it's error-free (I found some and fixed them) but if you find something, probably something that's not being expressed clearly enough please leave a message. Thank you SO much for sharing our pattern! Thanks a lot for this beautiful pattern! And congrats for the prize you won :) Hasta pronto! What a great pattern and it's free! Thanks for sharing!! I think I found an error on page 3 which I want to report. Maybe it's my misunderstanding the pattern, but I thought you could check it. It's in the first flower/big petals, pistil and stem: row 7 and 8 say "make 1 row (sc24). If I counted correctly it has to be sc30 because row 6 is "sc4,(M2, sc8) x2, M2, sc4" and that's 30 stitches. I like the pattern very much and maybe I'll put the FO in my office as you did! I love this pattern, it is so cute. I want to know if I can alter the flowers a little to make flower pins to sell with my hats on my etsy shop. What a beautiful pattern! Thanks so much for posting it, you're amazing! I love your creativity. Its amazingly beautiful. I have never seen anything as beautiful as this. I made daisy(from oswald) inspired by your pattern. wow! i love them! it's beautiful! I've downloaded this flower pot pattern, and started to make it. But I had a difficulty to understand the pM abbreviation. Could you please explain it? Anyway, this pattern is very pretty, and I love it very much! Thank you for sharing this pattern with us! is there a specific place in the pattern where you had difficulties to understand the abbreviation? I have found out that the term pM means 'place Marker', and now I can continue make this pretty flower pot :). Thank you. Hi Diana, thank you so much for the explain, now I'll be able to continue with the pattern, reading all the pages I found another thing, wath does it mean in the page 5 in the leave and stem in the 3 row "esc" is like single crochet, is just tha I don't know that abbreviation. Thank you so much. Oh, I love your pattern *-* thank you for sharing thi pattern to us! 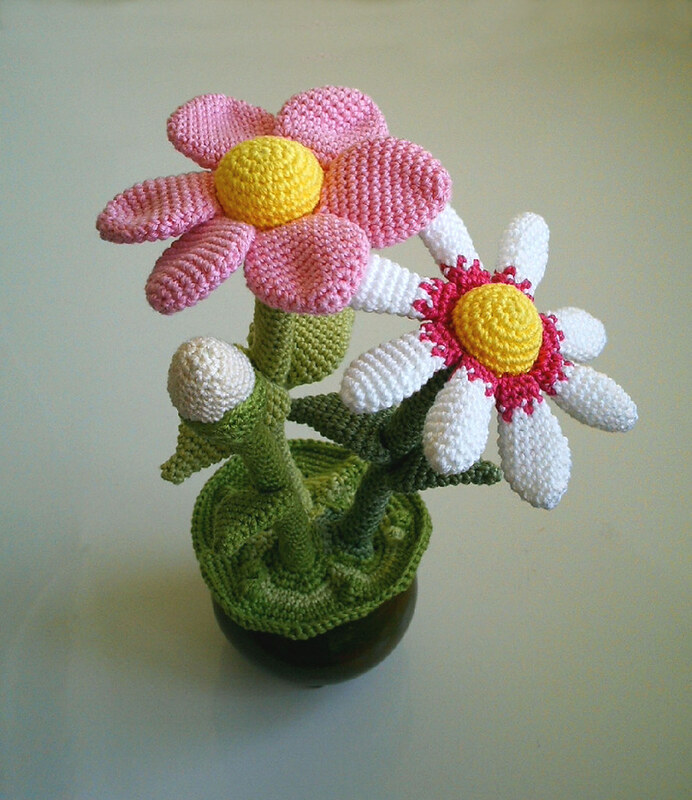 Thanks for sharing this adorable pattern! I love these flowers!! I've just taken a look, it's beautiful! My name is Diana and I am passionate about crocheting, knitting and pattern designing. I also craft, bake, cook and rant. If you find something that inspires you, please brighten my day by letting me know. And if you find an error in one of my patterns, send me a gentle nudge so that I can fix it. why I like WIP's so much . . .